Our music ministry strives to embrace the challenges presented in the church mission statement through leading music during the celebration of the sacraments, while providing a variety of musical styles to celebrate our diversity and to meet the spiritual needs of our parishioners and visitors. In our parish we offer three great Apostolates to participate in our musical worship. Under the direction of our Music director, our parish choir is comprised of both professional and amateur singers, representing many walks of life and covers diverse styles of liturgical music. 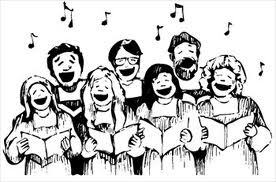 The adult choir sings at 10:30 AM Mass every Sunday and special celebrations following the liturgical calendar. Rehearsals are held each Wednesday at 7:00 PM in Room 101, old school building. For more information contact Jonathan Cordova thru the parish office. This choir started as an all-Filipino ensemble, and is currently mixed as it actually welcomes anyone who enjoys choral music. When a guitar is needed, Louis Ruberton provides the accompaniment. The choral director is Ruben Cordova, who uses traditional as well as his own musical arrangements. This choir is directed by Ruben Cordova with the parish Music Ministry Director Jonathan Cordova. Practice is every Friday, 5:30pm – 6:15pm, in the old school building, Room 101. New members are most welcome. Please reach Ruben by contacting the parish office.